Kirstenbosch Botanical Garden is proof that not all gardens were created equal. Go on, pay it a visit. You can thank us later. It’s a favourite among locals amd visitors alike for many reasons: picnics on the lawns, hiking up Skeleton Gorge, enjoying a glass of chilled Chardonnay before a summer sunset concert, exploring the many shady trails, and taking in the panoramic views from the canopy walkway, to mention just a few. Regarded as one of the great botanic gardens of the world, Kirstenbosch—or rather, the land on which it sits—was bequeathed to the government by Cecil John Rhodes. At the time, it was nothing more than ramshackle farmland overrun with pigs. In 1913 a botanist called Harold Pearson set about transforming the land into a botanic garden devoted to the country’s indigenous flora. It now contains over 7000 species of plants from southern Africa. The 528-hectare Kirstenbosch Estate (which includes the Garden) falls under the Cape Floristic Region, which is a UNESCO World Heritage Site. Situated on the slopes of Table Mountain, just 13km from the city centre, Kirstenbosch includes a fragrance garden, a medicinal garden, 2,500 species of plants found on the Cape Peninsula, a Protea garden (best seen in spring! ), a braille trail, and a cycad amphitheatre. There is also the Botanical Society Conservatory, which houses plants from the continent’s more arid regions. To immerse yourself in all that the Garden has to offer, it is worth taking one of the free guided tours that depart from the Visitors’ Centre at 11am and 2pm from Monday to Saturday. If the times are inconvenient, audio guides are also available. If you have little ones, you simply must take them to see the cycad amphitheatre. Dotted among the cycads are life-sized anatomically correct sculptures of dinosaurs and a pterosaur! Kirstenbosch also features a sculpture garden, where you’ll find an ever-changing exhibition of African stone sculptures, and bronze animal sculptures by Dylan Lewis. Your kids will also enjoy a walk along the Centenary Tree Canopy Walkway – affectionately known as the Boomslang. This 130-metre steel-and-timber bridge snakes its way through and over the trees of the Arboretum, providing stunning views of the Garden and the Cape Flats. All that walking is bound to work up an appetite, and – if you haven’t packed a picnic – there are a number of options for satiating your hunger. Visit the African themed Moyo restaurant for a hearty lunch, or pop into the Kirstenbosch Tea Room for scones, cake and cucumber sandwiches. You can even pick up a picnic hamper from either of these restaurants. For a quick coffee fix, Vida e Caffe has you covered. While the Garden is spectacular all year round, you’ll see the fynbos at its best from August to November. However, summer has its own charm in the form of the Summer Sunset Concerts every Sunday evening and the open air Galileo Cinema on Wednesday evenings. Get your city Sightseeing bus ticket and free entry to Kirstenbosch with a one day City Pass. 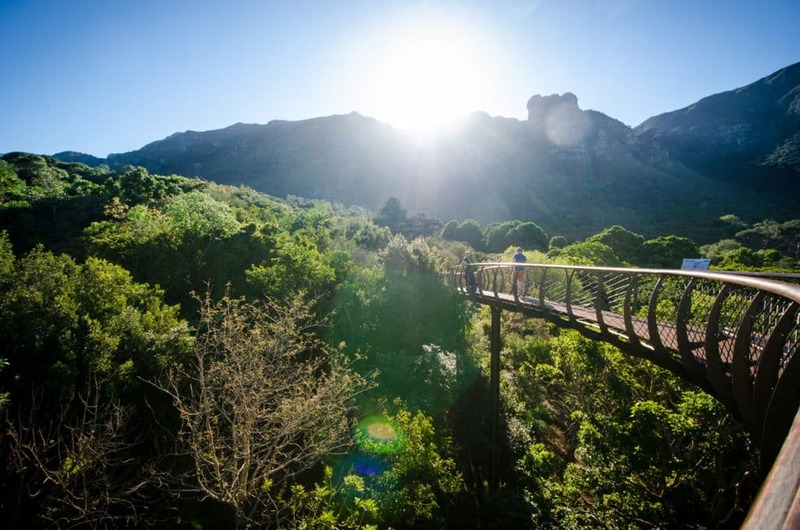 See pics others have shared at Kirstenbosch and share your own using #lovecapetown!